We love Halloween here at the Curtis household. I thought I’d share some pics of our haunted graveyard. There’s a sweet story behind these decorations, if you can believe it. I have four siblings, two of whom are much younger than I. 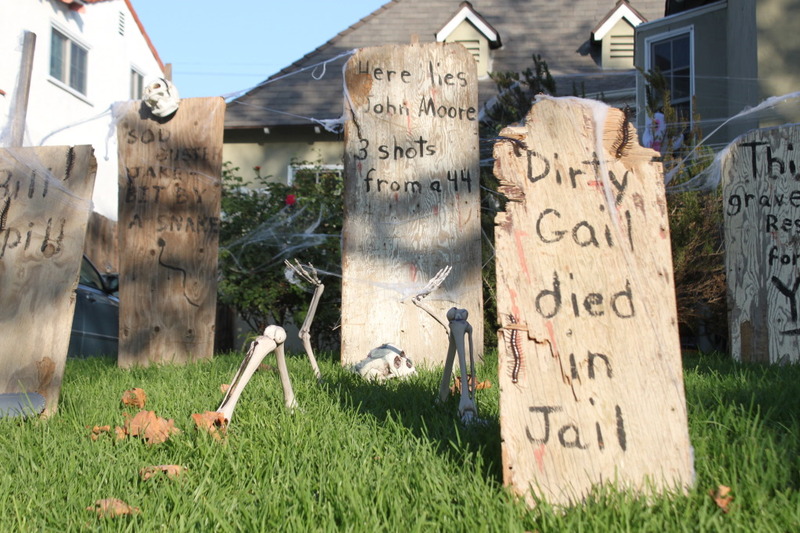 When I was a teenager, before they were born, I’d visit my dad’s house around Halloween, and a house down the street always had the coolest old west graveyard decorations taking over their lawn. Around the time that I went off to college, it seems the kids from that home also left the nest. When my brother and sister were toddlers, the owners of that home passed along the decorations to my father & stepmother so they could keep up the tradition on the street. Now my siblings are almost in college themselves, so the decorations were passed on to me to share with Scarlet. So these tombstones have history. We’ve also added a few new ones. I love the “old west graveyard” theme because it’s inexpensive and easy to execute! You just take scrap wood and paint silly halloween tombstone sayings on them, then use a mallet to drive a stake into your grass and lean the tombstone on it. Rain, sprinklers, and the elements only make the tombstones look more old and authentic. And of course, some skeleton limbs, zombie arms, and light-up brains only add to the fun. My favorite addition this year was Scarlet’s selection of rubber centipedes, which of course had to be placed on skulls. And my husband’s finger-on-the-doorbell brings me endless joy. I knew I married him for a reason. Check out some more pics of our easy Halloween Old West Haunted Graveyard after the jump, and tell me, do you think it’s too much? I really, really wanted a fog machine this year, but that seems a silly expense. Maybe next year. If only I could find a rubber tiger skeleton. Too much? or too hilarious? Hmm. Maybe my parenting could use a little work. Wherecdid you find the finger? How did you attach it? Love it! We are going to be doing our tombstones today to create our own graveyard! I can't wait! Thanks for sharing your pictures!! Love the doorbell! You and my mom would get along great, she loves Halloween more than Christmas. She loves creepy and gore and would start decorating in September, complete with stuff hanging low everywhere and she would switch out the regular light bulbs with colored ones so we were always running into stuff and setting something off either by stepping on it or motion detector my dad would go nuts! timmi your mom is my favorite person ever. Love it! We have gravestones for rock and paper, and a wanted poster for scissors on our front door. We give the kids who get the joke extra candy. I go for subtlety over a big show. We live in a dignified neighborhood and our street is lined with Queen Annes and Italianate mansions, I can just imagine what my neighbors would think if we did something that elaborate in our front yard . . . but it sure looks like fun! How do you get the finger to stay on the door bell? I’ve tried a couple different things, but the keep falling off. but if you use hot glue, how do you get it off afterwards? Love the fingers idea. It look really creepy. And also centipedes, it look real. I just bookmarked these ideas for this year’s Halloween and I bet it will make someone scare to death. Thanks for sharing your creepy Halloween decor project. Love this post! What are the fingers made of?